The arrests were ongoing Tuesday, he said, and wouldn’t necessarily end Tuesday either. Another 15 were indicted in county court Monday, and additional members are expected to be charged in Detroit. ”At least 48 individuals are targeted for arrest on various narcotics, violent crime and firearms related charges at the federal or state level as determined by the circumstances of each matter,” the Justice Department said. The drug trafficking organization has been operating in Huntington for nearly 15 years, trafficking heroin, fentanyl, and cocaine from Detroit to Huntington, the Justice Department said. The operation took at least 450 grams of fentanyl off of the streets — enough to kill more than 250,000 people. We have a major drug problem in America. According to the chart I found at statista, in America the highest number of deaths from drug overdoses occur to Americans between the ages of 25 and 55. 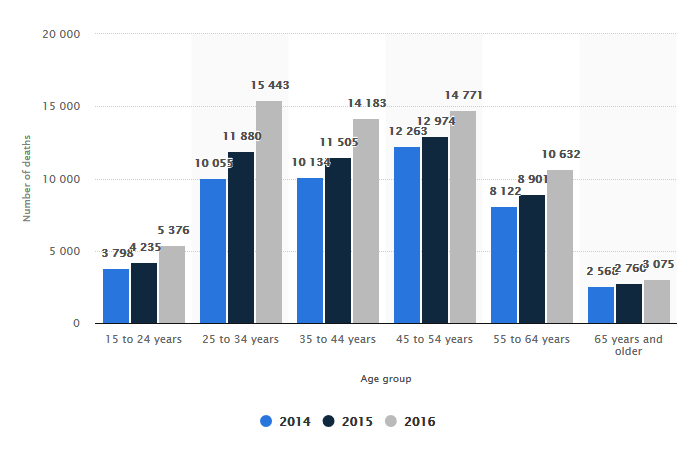 It is interesting to me that the age range that generally has the greatest amount of disposable income is the age range that is most likely to die from a drug overdose. It is very sad that many people get involved with drugs during the most productive years of their lives. Hopefully the taking down of the drug network in West Virginia will be the beginning of dealing with one aspect of America’s drug problem.